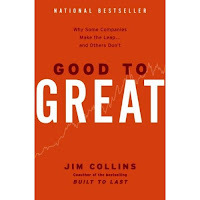 Recently I revisited an excellent book that I had read a few years ago, Good to Great by Jim Collins. When I initially read the book, I viewed it mainly from a corporation's perspective (of course I was working for a corporation at the time). However, now as an entrepreneur when I look at the key principles contained in this book, I realize that the model that Collins discovered of what makes a business great over the long-term applies to small businesses just as much as it does to large corporations. Collins writes on the first page of the book, "Few people attain great lives, in large part because it is just so easy to settle for a good life." Not only does this truth apply to life, but it also applies to your business. As hard as it is to become a good company, it is that much harder to become a great company. Greatness in business requires some essential components, including focused visionary leadership, commitment to continuous improvement, flexibility to respond to the changing marketplace, passionate perseverance and consistent execution of your strategy over time. The statistics that detail the lack of success of small businesses are staggering. The numbers tell us that 95% of all small businesses fail within 5 years. Yet when I look at the marketplace, the reason that number is so high is not due to the lack of great ideas. There's actually an abundance of great ideas in the marketplace. Instead, the reason that most small businesses fail often comes down to the fact that many (some would say most) entrepreneurs lack the willingness or ability to execute essential business principles to turn great ideas into great businesses. Don't Settle for Good When Your Business Can be Great! Level 5 Leadership: According to Jim Collins, this type of leadership, which by the way is not common, is defined by those who "build enduring greatness through a paradoxical blend of personal humility and professional will." This type of entrepreneur is more concerned with building a great business rather than just building a big bank account (read my post "Mission-Driven Entrepreneur"). Besides, one of the benefits of building a great business that gets sustained results over a long period of time is reaping the financial rewards that come along with it. The Hedgehog Concept: A common fallacy embraced by many aspiring (and some current) entrepreneurs is that you can grow a successful business based simply around your passion. Unfortunately, this idea is only partially true. The Hedgehog Concept says that for a business idea/model to be successful, it must be built around the intersection and close-knit integration of three critical components: 1) Something you are deeply passionate about, 2) Something you can be the best at, 3) and Something customers are willing to pay for. This is essentially your business "sweet spot". If you are missing one of more of these components, you will be hard pressed to build an enduring, successful business. Ask yourself, "Am I trying to develop a hobby, operate a charity, or build a business?" A Culture of Discipline: One of the reasons that many people, including myself, have spurned corporations for small businesses is the bureaucratic nature of many large companies. Nevertheless, entrepreneurs have to be very careful not to "throw the baby out with the bath water" as it relates to structure, systems and processes. Every business, large or small, needs these three essential elements to succeed. A sound organizational structure, efficient operating systems and consistent execution of core processes are crucial to your business's ability to grow from good to great. The key is how these elements are implemented, practiced and monitored. Collins writes, "The single most important form of discipline for sustained results is fanatical adherence to the Hedgehog Concept and the willingness to shun opportunities that fall outside [that model]." Basically, it takes discipline to know what to say "no" to. Flywheel and the Doom Loop: You are about to read something that is the complete antithesis of our microwave, instant gratification, get-rich-quick culture. Like a delicious home cooked meal, it takes a long time to grow a great company that gets consistent sustained results. Because of a flywheel's weight, it's hard to get it to start turning. However, after it starts turning, its weight causes momentum that actually keeps it going and even causes its speed to increase. Good-to-Great businesses build momentum with small successes that over time grow to become big successes. Attention to detail and perfecting what you do well now, especially the quality of your products/services and customer service, will create bigger growth opportunities for you in the future. On the flip side, short-term thinking/planning, chasing opportunities outside of your "sweet spot", and unethical behavior will lead to a downward spiral that is often irreversible. There is much more to this book than I've highlighted here that you can use to transform your great idea into a great business. And no matter where you are on your business journey, start-up or 10-year veteran, there is always room for improvement. I believe that if you apply even a few of the Good to Great principles you will be well on your way to avoiding the 95% small business failure abyss. I look forward to your greatness! Do small businesses really drive the U.S. economy? Just as they say that there are two sides to every story, that can also be true with statistics. Sometimes multiple conclusions can be drawn from the same data, especially as it relates to small businesses. A couple of years ago American Enterprise Institute (AEI) visiting scholar Véronique de Rugy made the controversial statement that small businesses didn't play as large of a role in driving the U.S. economy by creating jobs as the government and other organizations had claimed for many years. Based on her research, she believes that governmental policies predicated upon these deep-seated beliefs are not only wrong but actually damaging to small businesses and the economy at large. You can read the article, "A Talk with a Small-Biz Heretic", to get a better understanding of her perspective. "The report was issued by an office whose job it is to promote small businesses and create an environment that is more favorable. And they’re doing a good job presenting some of the ways small businesses have been successful. But I think the picture is a bit more complex." In terms of how minority owned businesses are incorporated into this discussion, last summer I discoverd an interesting statistic in a report provided by the Minority Business Development Agency. In 2002, 4.1 million minority owned businesses had 4.7 million employees, which is an average of 1.1 employees per business. This means that a high percentage of those small businesses had only one employee (although I don't know how a business can have 0.1 employees... maybe it's those who are physically but not mentally present, but I digress). That report also included an analysis that compared the number of minority owned businesses to the percentage of minorities in the population. The analysis revealed that if the number of minority owned businesses mirrored the minority population, i.e. "parity", there should have been 6.5 million small businesses that should have provided 16.1 million jobs. There's a big difference between 4.1 million and 16.1 million. Another focus of their analysis was a parity study of minority business revenues. Actual revenues for all minority businesses in 2002 was $700 billion. According to their parity projections, actual revenues should have been $2.5 trillion. That's a difference of $1.8 trillion! Now, there are plenty of reasons and factors why there are gaps between what these employment and revenue numbers are versus what they could/should be, which have been outlined in many studies, including the one here. And of course that was 2002. Still, how much has really changed since then? I wonder how those numbers would look for 2007-2008. Interestingly, in the Black Enterprise article, Harrison actually points out that many of the small businesses in the government's report are really one-person operations, which he says might be one of the reasons that the unemployment rate is at the point that it is. So, instead of going to look for another job after getting laid off, many people may now go try to start their own business, which would impact employment statistics, especially if there are so many one-person firms. The conclusion of all of this is that there seems to be a lot of differing perspectives and opinions by those who are looking at the same or similar information as it relates to small business's true impact on the U.S. economy. What do you think? Does this argument challenge your perspective on entrepreneurship and its overall value to our economy? Do small businesses really drive the economy as much as is purported and promoted? Has the government done enough to create an environment for small and minority owned businesses to grow and create jobs? Should it do less or more? I look forward to hearing from you. If you read my previous post, Pray for Africa, you will get an idea of the passion that I have for that great continent. Of course while prayer is essential, it is just the first step to creating change. The Bible says that prayer not accompanied by action is worthless (James 2:17). Therefore, in addition to praying, there is something else that I'm committed to doing. I have a vision for helping people in Africa build an entrepreneurial network that will result in exponential increases in economic empowerment, employment and education. Poverty is such an oppressive institution that it often drives people who feel powerless to do desperate things, and in African countries and elsewhere that often involves violence. One of the keys to reducing this violence is to reduce peoples' feelings of powerlessness and purposelessness. That's why I believe equipping people with entrepreneurial skills and resources, coupled with creating governmental policies and business environments that support and encourage entrepreneurship, will help to empower people personally, economically and socially. With this being the case, I was incredibly excited to find some enlightening and inspiring videos on YouTube of Paul Kagame, the president of Rwanda. He is talking about his belief that entrepreneurship can be a key component of strategically building a nation economically and socially. I agree with him wholeheartedly. Enjoy! My heart is broken to see the violence that has swept the country of Kenya over the past couple of weeks. Until a few years ago, I probably would have not given much thought to the events beyond looking at the news or reading it on the Internet. I would have viewed the situation as "their" problem. I was sympathetic, but not empathetic as in I didn't share their pain. In October 2006 I had a life changing, paradigm shifting experience. On my first trip across the ocean, I had the incredible opportunity to go on a missions trip to Rwanda. I came back from that trip with a whole new perspective on the world and an entirely new outlook on Africa. Before going, I thought I recognized them as human beings with hopes, dreams, feelings, issues, challenges, etc. Nevertheless, as crazy as this is going to sound, seeing them face to face and spending time with them gave me such a new and powerful appreciation for their humanity and dignity as human beings. For the first time, I saw Africans as my true brothers and sisters. But not just Africans. I began to see all people around the world as my brothers and sisters. So, when I see the reports of Kenyans, Sudanese and many other Africans dying violently, especially children, I now feel a deep sense of sadness, knowing that my brothers and sisters are hurting. The images that I see on TV and the Internet now are not just of "those people", but they could be the family, friends or neighbors of the people with whom I shared stories, laughed, cried and built friendships. Furthermore, "those people" are future world leaders, business people, doctors, lawyers, Olympians, entrepreneurs, educators, scientists and more. If you want a real-time example, just look at what's happening in our own presidential election here in the United States. I don't know how you feel, but I can't sit idly by and do nothing. The best thing that I can do right now is pray. Pray for the families. Pray for the children. Pray for the leaders. Pray for corruption to end and the violence to stop. Pray for poverty to decrease and education to increase. Pray for food to be plentiful. Pray for diseases to be cured and medicine to find those who need it. Pray for spiritual, emotional, and relational healing between the tribes. Pray a prosperous future, because whether or not you realize (or accept) it, our futures are tied together through the global economy. Although, we as humans often can't understand why we do such horrible things to one another, God is able to handle it all. So, please remember to pray for Africa.